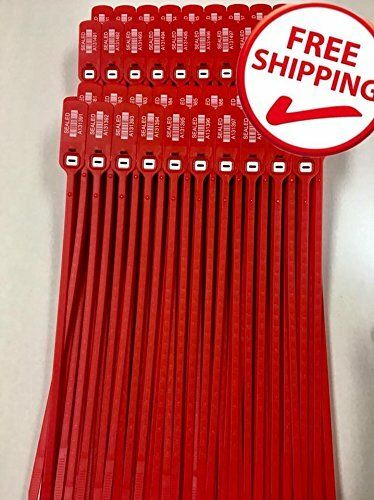 Heavy duty Red Plastic security seal, high-density polypropylene, co-polymer, Adjustable Strap fits any closure over 7mm diameter, Thickness of 2mm with a Full-Length of 400mm. Truck/Trailer Seals. Long Adjustable security seal used to secure trailer doors and transportation equipment. Strongest plastic trailer seal available. Patented locking chamber provides superior tamper resistance. Durable, all-plastic, one-piece construction. Weather resistant HDPE withstands extreme cold and heat. Consecutively numbered. Produced in easy-to-use strips of 10 with no plastic waste. 16 inches Heavy duty security seal, high-density polypropylene, co-polymer, Adjustable Strap fits any closure. Used to secure trailer doors and transportation equipment, strongest plastic trailer seal available. Full-Length of 400mm, 7mm diameter, Thickness of 2mm. Consecutively numbered and produced in easy-to-use strips of 10 with no plastic waste. If you have any questions about this product by AVG Packaging Supplies, contact us by completing and submitting the form below. If you are looking for a specif part number, please include it with your message.